So, what ARE Ecigs all about? They’re a quit method, right, like NRT but without all the daft medicinal thing and the stigmatizing “patient” status, yeah? Well, no. Not really. I mean you CAN decide to quit completely and for good and use Ecigs as the prop to help you get there, but that’s not really what they’re about. They’re not about starting on 20mg nic eliquids and gradually weaning yourself off. In fact, that’s a bloody silly thing to do…. Big sellers like Coke and PlayStation keep the numbers going year on year but, according to Time Magazine, we can obtain a good snapshot of where society is by looking at the trends of leading growth products. So what are people consuming in abundance currently, where do electronic cigarettes figure and how many of these reflect the way you lead your life? The e-cigarette debate is pretty heated. On one side, there are legions of anti-smokers turned anti-vapers warning the smokers of the world away from harm reduction because of the potential for comparably miniscule levels of harm, and on the other you have us vapers, fervent in our support of the devices that helped us quit smoking and eager to jump down the throats of anybody repeating unsupported or downright false statements about e-cigarettes. A HEALTH board boss believes Scotland could be smoke-free in less than 20 years, following the 10-year anniversary of public spaces smoking ban. It was the first in the UK and since then childhood asthma-related hospital admissions have fallen by 18 per cent every year and there have been reductions in pregnancy ­complications and certain types of stroke. Like most professional pundits, Margaret Cuomo has perfected the art of speaking authoritatively even when she does not know what she is talking about. Unlike most professional pundits, Cuomo is in a position to cause real damage…. My company is today proud to donate £1,000 to @NNAlliance to help continue their great work supporting & promoting tobacco harm reduction. Unfortunately, CVS Health has disseminated false information to the public. It is not true that vaping is just as hazardous as smoking. 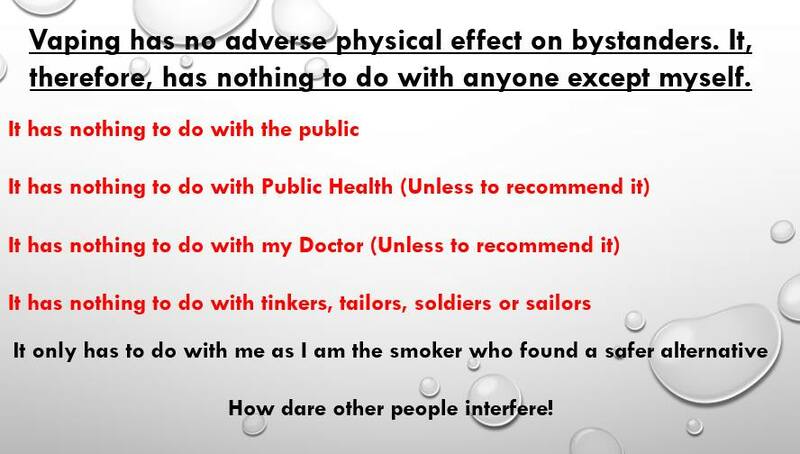 There is abundant scientific evidence that vaping is in fact much, much safer than smoking..
Audrey Silk, via her CLASH organization in New York, recently launched a “Smoking is Normal” campaign (CLASH Facebook page, campaign Facebook page, press release). All the talk we hear about e-cigarettes “renormalizing” smoking is premised on a claim that something that about a fifth of the U.S. population does (and a larger portion in most rich countries) is not normal…. Combustible tobacco cigarettes cost less to purchase than equivalent amounts of electronic cigarettes (e-cigarettes) in 44 of 45 countries sampled around the world, according to a new American Cancer Society study…. Cigarette taxes have been the target of state legislators nearly every year; however, more states are taking aim at adding levies to electronic cigarettes and vapor products. According to a new report by the Tax Foundation, four states, Washington, D.C., and three local jurisdictions have enacted taxes on vapor products as of Jan. 1. Two tobacco giants are seeing strong demand for their reboots of the e-cigarette in Japan, with Philip Morris International (PM.N) twice postponing a nationwide rollout and Japan Tobacco (2914.T) suspending shipments – both due to supply shortages…. Over the last year and a bit, the vaping community in Ontario has been hit hard by the Ontario Government position with vaping. Bill 45 is a constant reminder that they do not understand that vaping isn’t smoking!